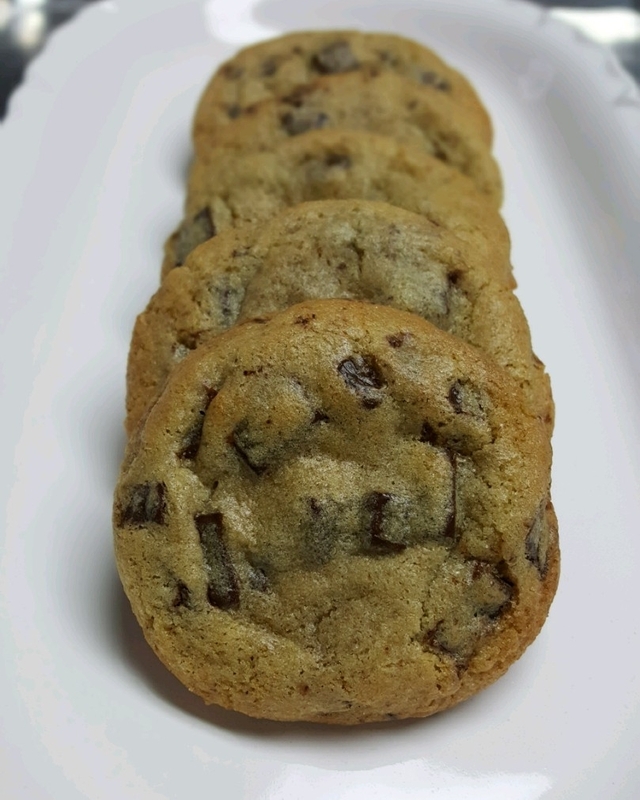 Chocolate Chip Cookies- Allergen Friendly! Well, as promised, below is the recipe for Gluten Free / Dairy Free Chocolate Chip Cookies. This was Chef Ben's first go at the cookie so we were not sure how they would bake, feel or taste. I am pleased to say, they're a keeper! 8oz Non-Dairy Butter (we use sticks of Earth Balance Vegan Buttery Sticks) *Can use regular unsalted butter if non-dairy is not a requirement for you. *Note: It's going to seem like a long process because of the rest times, but it's worth it. Cookie dough freezes incredibly well, so you only have to make the dough once in a while! Add 1 egg, mix only until incorporated and then add second egg, mixing only until incorporated and then add the vanilla and mix for 5 seconds. Turn mixer down to low speed and add approximately 1/3 of flour mixture only until incorporated. Add another 1/3 of flour mixture until incorporated, and add final 1/3 of flour mixture until incorporated. *There will no longer be visible signs of flour once incorporated. Stop mixer. Add chocolate chips and mix on low for 5-10 seconds. Remove dough and scrape bowl onto plastic wrap. Wrap securely (2-3 wraps) to ensure it's well wrapped and protected from air. Refrigerate for at least 2 hours. Once refrigerated, use ice cream scooper to dish cookie dough onto parchment paper. Average ice cream scooper will yield approximately 20 cookies (2.5 oz each). Fold parchment over dished dough, wrap in plastic and place in freezer for a minimum of 2 hours. *We recommend making a lot of dough so you can keep ready to bake cookies in your freezer for months at a time. Line cookie sheet with parchment and place cookie dough evenly on sheet with 3 inches between each cookie. Bake for 7 minutes, rotate tray 180 degrees and bake an additional 6-7 minutes. Remove sheet pan and allow to cool for 10 minutes. Using a spatula, move cookies to a wire cooling rack to complete cooling process. Note: You may enjoy warm gooey cookies which will make your cookies ready to eat after the initial cooling time. We recommend allowing the cookie to cool completely in order to fully enjoy the texture of Chef Ben's House Cookie.